Enhance liturgical celebrations with this incredible mariachi Mass setting from Grammy-nominated Pedro Rubalcava. This guitar songbook provides chords, melody, vocal harmonies and lyrics for the songs on Misa del Sagrado Corazón, a Mass setting arranged for mariachi by Pedro Rubalcava. Brassy staccato trumpets, lush and harmonious violins, the percussive strum of guitar strings, the syncopated bass-y bounce of the guitarrón, tight vocal harmonies—the distinct sounds of mariachi music are recognized the world over. Situated at the intersection of culture and religion, this traditional folkloric genre of music is significant for many Hispanic/Latino communities, and now this authentic music is available to enhance the liturgies and special celebrations in your community. Composed by Grammy-nominated composer Pedro Rubalcava, Misa del Sagrado Corazón (Mass of the Sacred Heart) is the first complete Mass setting arranged for Mariachi ensembles published by OCP that utilizes approved texts from the Misal Romano. Set in accessible and easy-to-learn parts, this inviting and lively Mass setting is truly a Mass for the people. Derived from folkloric Mexican dances, the styles featured in Misa del Sagrado Corazón (son, huapango, jarabe and joropo) are common to mariachi musicians. Structurally speaking, the rhythm section is composed of a guitarrón (large Mexican bass guitar) and vihuela (guitar-like instrument) as well as a traditional guitar. The violins and trumpets form the melodic and harmonic introductions, interludes and fills that are a hallmark of the mariachi sound. Recorded in Los Angeles by world-renowned Mariachi los Camperos, the CD offers exceptionally produced music that, aside from delighting the listener, can serve as a great learning tool to help singers and instrumentalists learn the vocal harmonic structure and accompaniment parts. A full score manuscript edition is available with all the instrument parts, or individual instrumental parts can be downloaded as needed for your specific group. Intended to invite participation by the people, many of the songs have a call and response format that lends itself nicely to the dynamic nature of the liturgy. While ideal for special liturgical celebrations such as the Feast of Our Lady of Guadalupe, Misa del Sagrado Corazón would also serve well for weddings, funerals and quinceañeras, in essence, any celebration that could benefit from an infusion of this delightful and vibrant music. Brassy staccato trumpets, lush and harmonious violins, the percussive strum of guitar strings, the syncopated bass-y bounce of the guitarrón, tight vocal harmonies—the distinct sounds of mariachi music are recognized the world over. Situated at the intersection of culture and religion, this traditional folkloric style of music is significant for many Hispanic/Latino communities, and now this authentic music is available to enhance the liturgies and special celebrations in your community. Composed by Grammy-nominated composer Pedro Rubalcava, Misa del Sagrado Corazón (Mass of the Sacred Heart), is the first complete mariachi style Mass setting published by OCP that utilizes approved texts from the Misal Romano. Set in accessible and easy-to-learn parts, this inviting and lively Mass setting is truly a Mass for the people. Derived from folkloric Mexican dances, the styles featured in Misa del Sagrado Corazón (son, huapango, jarabe and joropo) are common to mariachi musicians. Structurally speaking, the rhythm section is composed of a guitarrón (large Mexican guitar) and vihuela (guitar-like instrument) as well as a traditional guitar. The violins and trumpets form the melodic and harmonic obbligato introductions, interludes and fills that are a hallmark of the mariachi sound. Recorded in Los Angeles by world-renowned Mariachi los Camperos, the CD offers high quality produced music that, aside from delighting the listener, can serve as a great learning tool to help singers and instrumentalists learn the intricate vocal harmonic structure and accompaniment parts. A full score manuscript edition is available with all the instrument parts, or individual instrumental parts can be downloaded as needed for your specific group. Intended to invite participation by the people, many of the songs have a call and response format that lends itself nicely to the dynamic nature of the liturgy. 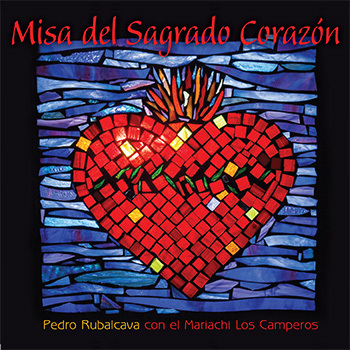 While especially ideal for special liturgical celebrations such as the Feast of Our Lady of Guadalupe, Misa del Sagrado Corazón would also serve well for weddings, funerals and quinceañeras, in essence, any celebration that could benefit from an infusion of this delightful and vibrant music. Composed by Grammy-nominated composer Pedro Rubalcava, Misa del Sagrado Corazón (Mass of the Sacred Heart), is the first complete Mass setting arranged for Mariachi ensembles published by OCP that utilizes approved texts from the Misal Romano. Set in accessible and easy-to-learn parts, this inviting and lively mariachi Mass setting is truly a Mass for the people. Derived from folkloric Mexican dances, the styles featured in Misa del Sagrado Corazón (son, huapango, jarabe and joropo) are common to mariachi musicians. Structurally speaking, the rhythm section is composed of a guitarrón (large Mexican bass guitar) and vihuela (guitar-like strum instrument) as well as a traditional guitar. The violins and trumpets form the melodic and harmonic introductions, interludes and fills that are a hallmark of the mariachi sound, ideal for a festive folk mass or for feasts where Mexican-Americans celebrate their faith. Recorded in Los Angeles by world-renowned mariachi band los Camperos, the CD offers high exceptionally produced music that, aside from delighting the listener, can serve as a great learning tool to help singers and instrumentalists learn the intricate vocal harmonic structure and accompaniment parts. A full score manuscript edition is available with all the instrument parts, or individual instrumental parts can be downloaded as needed for your specific group. Intended to invite participation by the people, many of the songs have a call and response format that lends itself nicely to the dynamic nature of the liturgy. While especially ideal for special liturgical celebrations such as the Feast of Our Lady of Guadalupe, Misa del Sagrado Corazón would also serve well for weddings, funerals and quinceañeras, in essence, any celebration that could benefit from an infusion of this delightful and vibrant music of guitars trumpets and violins.